A boutique is "a small store that sells stylish clothing, jewelry, or other usually luxury goods". The word is French for "shop", which derives ultimately from the Greek ἀποθήκη (apothēkē) or "storehouse". The term "boutique" and also "designer" refer (with some differences) to both goods and services which are containing some element that is claimed to justify an extremely high price, itself called boutique pricing. As with the fine art market, and the use of art in money laundering schemes, national governments have to be concerned with boutique shops and the high pricing of boutique goods as instruments in fraud and other financial schemes. The term "boutique" entered common English parlance in the late 1960s. In Europe, Avenue Montaigne and Bond Street were the focus of much media attention for having the most fashionable stores of the era. Some multi-outlet businesses (chains) can be referred to as boutiques if they target small, upscale market niches. Although some boutiques specialize in hand-made items and other unique products, others simply produce T-shirts, stickers, and other fashion accessories in artificially small runs and sell them at high prices. 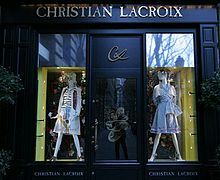 In the late 1990s, some European retail traders developed the idea of tailoring a shop towards a lifestyle theme, in what they called "concept stores", which specialized in cross-selling without using separate departments. One of the first concept stores was 10 Corso Como in Milan, Italy, founded in 1990, followed by Colette in Paris and Quartier 206 in Berlin. Several well-known American chains such as Tiffany & Co. Urban Outfitters, Dash, and The Gap, Australian chain Billabong and, though less common, Lord & Taylor, adapted to the concept store trend after 2000. Nowadays, however, people are turning more and more to online shopping. Retailers as well as buyers, due to lack of time, prefer to be able to order their stocks, or pieces through 1-3 clicks. Online boutique business has a lot of good sides, like there is no need to pay a high rent or invest in the store or the possibility to manage the store wherever you are, which make retailers to turn more and more towards internet. For the buyers, online shopping represents the possibility to save time as well, since they can order the item and get it delivered in just a few days. Look up boutique in Wiktionary, the free dictionary. ^ "boutique". Merriam-Webster's Dictionary. Retrieved October 1, 2014. ^ Avalith. "Historypin - Tours - Carnaby Street, 1960s London". historypin.org. ^ "Starting a Boutique Business". Jalingo.co. Retrieved August 23, 2015. ^ "New retailers floor customers". Sydney Morning Herald. April 19, 2004. Retrieved 2008-10-29. ^ Katya Foreman. "Colette Unveils Redesigned Store Interior". WWD. ^ "Quartier 206". unlike.net. Archived from the original on 2008-10-25. ^ "Urban Outfitters: Dressed For Success". Forbes. December 20, 2007. ^ Wernick, Ellen (2003). "Urban Outfitters, Inc". International Directory of Company Histories. ^ "colette and Gap collaborate on new store (Vogue.co.uk)". Vogue UK. Archived from the original on 2008-12-01.